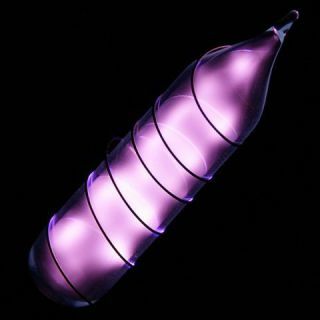 Vial of glowing ultrapure helium: image via Wikipedia.orgNobel Prize-winner, Robert Richardson, physicist at Cornell University suggests that party balloons should cost $100 each to reflect today's price of helium. While I doubt that balloon and helium tank dealers will take Richardson's suggestion to heart, you may have already seen the price of helium balloons double. And that's nothing compared to the impact of the helium shortage on its biggest users: scientists, engineers, and medical device manufacturers. Helium is used in imaging systems, computer processors, and magnetic resonance imaging (MRI) to name a few industries. Where life many be at stake, MRI and other medical technology are either going to have to find a suitable replacement, or continue to pay exorbitant prices for this gas. This year alone, prices have gone up 20 to 30 percent, depending on what the helium source charges. In the making of an MRI device helium is cooled until it turns to liquid, when it acts to prevent the magnets from over heating. “Liquid helium is this amazing stuff that can be used at very cold temperatures,” P. Chris Hammel, an Ohio State University physicist, told the Columbus Dispatch. But the situation is not likely to improve. Though helium is the second most common element in the universe, it is very difficult to isolate helium from other elements on earth. The most common source of helium was natural gas fields, where small amounts of helium could be isolated. Apparently those fields are no longer producing much helium and the more recent natural gas finds are not turning out to be great sources of helium either. To make matters worse, in 1996 Congress acted to phase out what was the Natural Helium Reserve in Amarillo, Texas, established in 1925 to guarantee that helium would be available for necessary uses. To deplete the reserve, large quantities of helium were sold at cheap prices. A bubble tends to burst: the new bill calls for the Reserve to be depleted by 2015. What then? Richardson, who was worried about the eventual depletion of capturable helium on earth since the 1980s, says "This is a fact of life that we're really trying to deal with." Rubbish from rampers of Central Petroleum stock in Australia. I seem to have read all this end of the world running out of helium story before, on forums for CTP on the Australian market. Their share price is in long term trouble as once Air Liquide gets their new Qatar Helium purification plant (Biggest in the world) fully online to extract helium from the huge sources in Algeria, Poland and new gas fields in Australia, the cost of non federal reserve helium will plummit and I guess some of the stock holders want out of Central Petroleum and into Air Liquide stock. One look at the share price graphs of both companies and a plot of press releases and comments from so called experts and you can see for yourself what the game is they are playing with the press. Unfortunately CP is listed in Australia and AL in France so the SEC say they can't act, but must wait for the Australian authorities to investigate what has been reported to me as blatant stock ramping or insider trading on a fairly large scale (CP is mostly Chinese owned). There is however a great need not to waste any natural resources like helium, which although it has vast available resources as a byproduct of natural gas liquifaction in many countries, is not being made by natural processes. If you want to do something useful try telling NASA who are the major helium waster in the US to capture and recycle the serious amounts of helium is lets go, when pressure checking rocket liquid fuel tanks and engines. It also use helium to purge and pressurise the fuel tanks etc before each launch, but they need to spend money on new sealed buildings and a high efficiency purification plant to save about 90% of the helium they use, which is what other countries that do not get cheap helium from the federal reserve do at present. Also building nuclear power stations is nuts, end of story. If you want the real story about helium see Gasbags comedy web site and then look at the HELIUM PAGE of: www.hybridblimp.net or indirect domain: www.airship.me from Montenegro. PS. The entire LTA sector uses about 3% of helium supply including toy balloons but NASA will use about ten times that this year!! I told you so, but did you listen? New gas fields with more helium than old ones! ---and the more recent natural gas finds are not turning out to be great sources of helium either. Now that is news if you hold stock in Air Liquide or Linde!! The last main new gas field to come into production was Algeria, which is partly owned by Linde and if you look at their site it is producing the highest concentration of helium for many, many years. The Chinese are playing this game trying to get the US to stop using federal helium before the Qatar extraction and purification plant is available because they own companies that are sitting on gas field discoveries that have proven high helium content from test wells. The Geologists will tell you the deeper the gas field is, the higher the helium content in simple terms. The Japanese and Chinese are not the best of friends at present because there is a huge natural gas field in deep water that is far enough down from the sea bed to have a very high helium content which makes the price they can sell LNG to the Qatar plant higher than normal. They will do everything in their power to get the US to buy not sell helium from the Amarillo reserve. Also whilst I am ranting here, there are new liquids under development to replace most of the helium that is used for cooling super conductors etc. Hard to say how long it will take to make a new chemical coolant that will not cost more than helium, but it can and will be done, also there is a trend to use Argon for specialist welding outside the US.